MAR 26 / THE KENNEDY CENTER / WASHINGTON D.C.
October 19 / Return Home CD RELEASE!!! 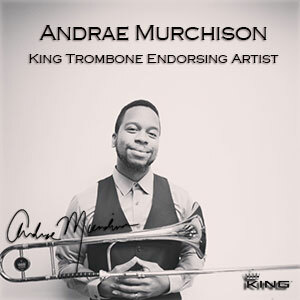 Andrae Murchison is an ideal example of the "Young Lion" trombonists who has become a part of the Jazz scene in the past fifteen to twenty years. This should not come as a surprise to anyone who has ever seriously heard him play. 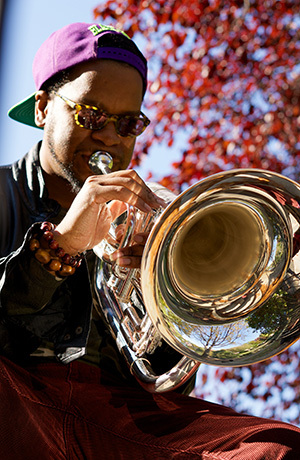 There are several significant reasons for Andrae's development in becoming one of today's established Jazz trombonists. The following reasons are just a part of his overall makeup. First and foremost is his innateness (essential, cannot be learned), enough said. Other important influences include legacy, exposure and spirituality. James Young (Trummy Young) who was an integral part of the swing era and featured with Louis Armstrong for more years for more years than any other trombonist, is a Savannahian. That fact should be enough to support Andrae's success as an imaginative and creative player. Add to that other Savannahians who include: Jabbo Smith, James Moody, Sahib Shihab, Ben Riley, Irene Reid, Johnny Mercer, Kaiser Marshall, Willie Draper, Ed Pazant, George Harper and a host of others and Savannah's Jazz legacy becomes quite lucid. The Jazz legacy in Savannah includes several other important aspects: Savannah is a thriving southern seaport city, its music history independently parallels that of New Orleans, it had a strong Jazz presence and numerous venues for playing, three military installations with bands and most importantly, native Savannahians took a sincere interest in young players who were serious and showed promise. Exposure and spiritually were hand in hand experiences that Andrae embraced simultaneously. The United House of Prayer for All People (holiness church organization), started in 1927 by Bishop Charles Manuel Grace, aka, "Sweet Daddy" Grace, is known for its musical spirituality with the strongest focus being on brass instruments and singing. Although its bands are comprised of all types of instruments the trombone is predominant. Andrae's grandfather was a devoted member of the House of Prayer and Andrae attended church regularly with him. Not only were trombones the predominant instruments, but Andrae was intrigued by their brilliance and power. If you have ever experienced trombone playing in any of churches(Southeast/Northeast coasts from Florida to New York), two aspects of trombone playing will certainly get your attention......the stamina of the trombonist and the mastery of the altissimo range. Trombone playing in the United House of Prayer churches is far more spiritual than technical, not taking anything from the technique. When you combine Andrae's association with the United House of Prayer, the legacy that Savannah is known for and the exposure to teaching and dedicated mentors, this writer, being one of them, Andrae's development is proof positive of outstanding results. With two of the better Jazz schools under his belt, Oberlin and Queens Colleges and being a part of today's Jazz scene performing with the likes of the Ellington and Basie Bands, Roy Hargrove, Abdullah Ibrahim, the Skatalites Band and a host of others. 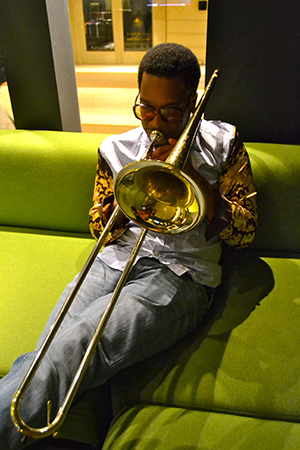 Andrae Murchison's place in the Jazz world as an innovative trombonist and composer is assured. I'm most pleased that he passed my way while embarking upon his musical journey.